The GEM-TX is the next generation of affordable engraving machines from U-MARQ. With a flat engraving area of 160 x 75 mm self-centering vice, it’s perfect for dealing with individual items or production runs. The U-MARQ Gem-TX is the fastest and easiest gift and jewellery, mechanical engraver in the World. The GEM was the first truly versatile, small, affordable engraver to suit any budget. The GEM-TX continues in this tradition.. The GEM-TX comes with self-centering vice, jigs for holding a wide variety of merchandise (trophy plates, lighters, hand bag mirrors, pet tags etc.). The high-speed spindle motor enables you to burnish in coated metals as well as deep engraving in to plastics and some metals. Ease of use enables everyone to engraving gifts and jewellery to a professional standard, after just a short introduction. 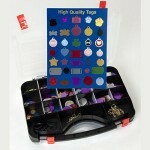 The GEM-TX is ideal for engraving Pet Tags quickly and efficiently with templates for most Pet Tags. Why be restricted to text, with the GEM-TX you can engrave any type of graphic images, logos its only limit is your imagination. items. With unique pressure settings, even fine gold lockets can be engraved without fear of damage. The Xenetech Viper 912 has a 9” by 12” (228.6 mm by 304.8 mm) engraving area and is an entry level rotary engraving system designed primarily for traffolyte engraving, engraving signs, nametags, trophy plate, awards, small jewellery items, identification plates and small panel faces. The system contains Xenetech’s automatic surface sensing capability that allows for flat and curved surface engraving on various materials including plastic, brass and aluminium. The Viper Electronics connect via Ethernet connection. This type of connection will allow you to download jobs from multiple computers on your local network straight to the machine. The jobs can be easily downloaded to a job queue and recalled by the engraving system operator. This feature alone can make your work orders flow more efficiently. You can also recall previously engraved jobs from the touch screen and you can be away from the machine but still check via the network where the machine is engraved up to.Job preview at the Viper Color Touch screen allows the end user to check their job before engraving.Up to 4 offsets can be saved at the Touch screen. This allows you to save and load offsets for vises or special fixtures. The easy jogging and micro-jogging features on the touch screen allow you to set permanent or temporary home positions accurately and efficiently. The GEM-RX is the next generation of affordable engraving machines from U-MARQ. With a flat engraving area of 160 x 75 mm and 50 mm cylindrical capacity and self-centering vice, it’s perfect for dealing with individual items or production runs. Combining flat bed and cylindrical engraving has never been achieved in a computerised engraving machine of this size and quality before. The U-MARQ Gem-RX is the fastest and easiest gift and jewellery, 4-axes mechanical engraver in the World. The GEM was the first truly versatile, small, affordable engraver to suit any budget. The GEM-RX continues in this tradition.. The GEM-RX comes with self-centering vice, jigs for holding a wide variety of merchandise (trophy plates, lighters, hand bag mirrors, pet tags etc.). 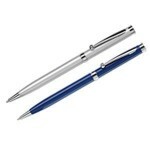 With the cylindrical axis you are able to engrave 360° round a pen or shot glass. The high-speed spindle motor enables you to burnish in coated metals as well as deep engraving in to plastics and some metals. Ease of use enables everyone to engraving gifts, rings and jewellery to a professional standard, after just a short introduction. One of the challenges for a traditional 3-axis machine is how to engrave a pen, or other round objects. The U-MARQ GEM-RX offers the perfect answer, by using true 4-axis functionality; it will engrave 360 degrees around a pen or other small cylindrical objects. The GEM 8 software has been configured to make this normally complicated task, easy to use to get spectacular results. The GEM-RX is ideal for engraving Pet Tags quickly and efficiently with template for all U-MARQ Pet Tags, (much higher quality than most) and other makes. Why be restricted to text, with the GEM-RX you can engrave any type of graphic images, logos its only limit is your imagination. fully features jewellery engraving centre with virtually no limits.